While Trampolines can be great fun and good exercise, there are certain safety precautions to keep in mind when children are using it. Over 200 000 children are treated for trampoline injuries each year in the United States. Keep these trampoline safety tips in mind when you purchase the best trampoline for your family. We recently found this awesome trampoline on our vacation! My kids gravitate towards trampolines everywhere! Never allow more than one person to jump at a time. Collisions can cause injury. Do not install your trampoline near trees, fences, posts or any other obstacles that a child could hit in case of a fall. 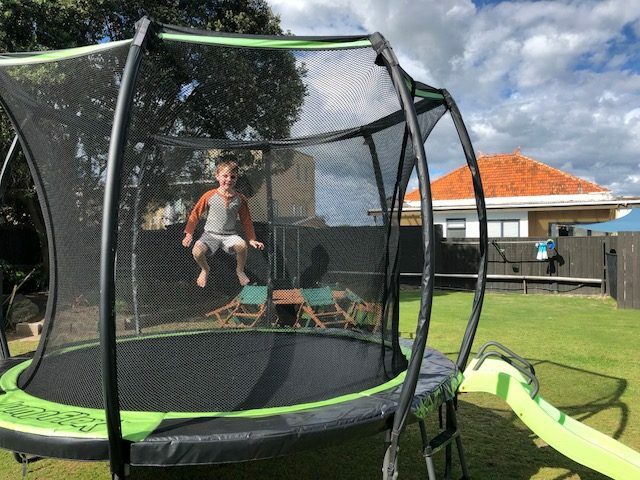 Ensure all springs are in the correct position before allowing children to use the trampoline. Use the trampoline ladder to get on and off. Do not jump off the trampoline on to the ground.